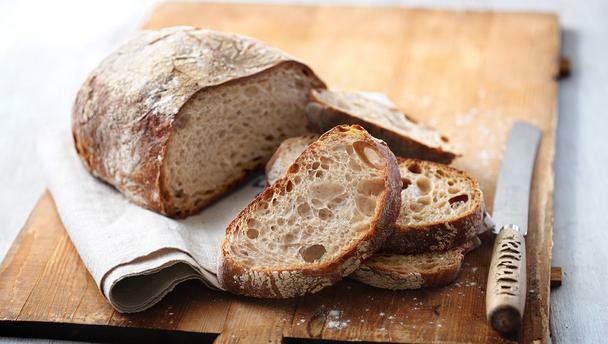 Sourdough is a bread product made by a long fermentation of dough using naturally occurring lactobacilli and yeasts. In comparison with breads made quickly with cultivated yeast, it usually has a mildly sour taste because of the lactic acid produced by the lactobacilli. The preparation of sourdough begins with a pre-ferment, made of flour and water. The purpose of the starter is to produce a vigorous leaven and to develop the flavour of the bread. In practice there are several kinds. The ratio of water to flour in the starter varies and a starter may be a fluid batter or a stiff dough. Finally, the starter is mixed with flour and water to make a dough of the desired consistency. The starter weight is usually 13 to 25% of the total flour weight, though formulas may vary. The dough is shaped into loaves, left to rise, and then baked. Because the rise time of most sourdough starters is longer than that of breads made with baker's yeasts, sourdough starters are generally unsuitable for use in a bread machine.